Whilst browsing the headlines over breakfast yesterday morning, I came across the sad news that Erick Lee Purkhiser, a.k.a. Lux Interior, has died at the age of 62. As frontman of The Cramps since the mid-1970s, he has been responsible for some of the sleaziest music in my collection and was famed for his intense live performances. 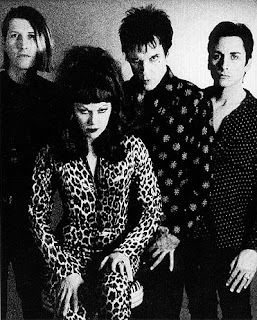 The Cramps are also one of the few bands I can think of who have stuck to the same musical style for over 30 years. Now you may think that shows a lack of ambition, but you know what you're getting with a Cramps record and they never disappoint. Their music was a blend of primal rock 'n' roll and surf guitar, infused with a perverse sense of humour. The lyrics generally focused on trashy 1950s Americana and horror movies, and this fascination with the weirder aspects of life spilled over into other areas of their career. The band famously played a free concert for the inmates of Napa State Mental Hospital, and also appeared in a Halloween special of "Beverly Hills 90210". Lux Interior allegedly took his stage name from a car advert. Apart from his great stage presence, my lasting memory of Lux Interior will be of a stylish dresser, particularly in his latter years when he wasn't made up like a zombie. I hope when I'm in my sixties I can carry off the kind of vintage suits that he wore.